Honeymoon Petra Villas is situated on the Caldera cliffs of Santorini (2-3 min on foot from the main road), in the picturesque village of Imerovigli. It has been built according to the traditional style of the island. Each unit offers fully equipped and modern facilities. All of them have a spectacular view to the caldera, the volcano and the satellite islands of Santorini, including views to the three-quarters of the main island to Firostefani, Pyrgos, Kamari and Akrotiri. The first thing you notice about the hotel is the reception area. A traditional hillside house with a blue gate is where you will find the staff awaiting your arrival. Stone terraced patios adjoin every luxury Honeymoon Petra villa, and every villa has a view of the bay. One can see the yachts and cruise boats below, the islands shimmering on blue water. Seagulls swoop to catch their daily meal. There is nothing quite like it. Open plan studios consisting of a Living/Sitting area with one double bed, fully equipped Kitchen, Bathroom and a private Terrace or Balcony overlooking the breathtaking view of the Aegean Sea and the Volcano. They consist of one open plan Bedroom with double bed, Living/Sitting area with one or two sofa beds, fully equipped Kitchen, Bathroom and a private Terrace or Balcony overlooking the Aegean Sea and the Volcano. They consist of one separate Bedroom with double bed, Living/Sitting area with two sofa beds, fully equipped Kitchen, Bathroom and a private Terrace or Balcony overlooking the Aegean Sea and the Volcano. They consist of two separate Bedrooms with one double bed in each one of them, Living/Sitting area with two sofa beds, fully equipped Kitchen, two Bathrooms and a private Terrace or Balcony overlooking the Aegean Sea and the Volcano. It is a unique house in three different levels, caved into the cliff, consisting of one Bedroom with double bed, Living/Sitting area with Fireplace and two sofa beds, fully equipped Kitchen, Bathroom and a private Terrace with a hot water built-in Jacuzzi, hanging on the edge of the cliff. 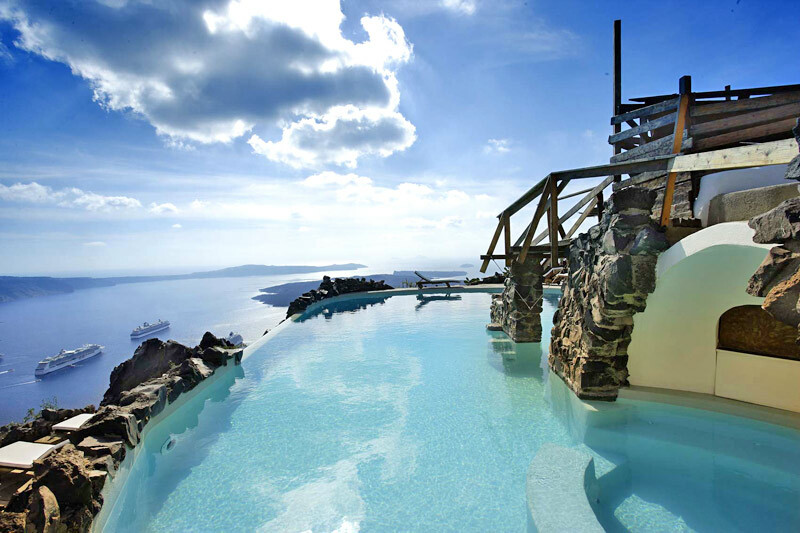 You can enjoy the breathtaking view of the Aegean Sea and the Volcano even from inside the Jacuzzi. Open plan cave-style apartments dressed with black volcanic stone on the outside, consisting of a Living/Sitting area with one double bed, fully equipped Kitchen, Bathroom and a private Terrace or Balcony overlooking the Aegean Sea and the Volcano. Cave-style apartments dressed with black volcanic stone on the outside, consisting of one Bedroom with double bed, Living/Sitting area with one or two couches, fully equipped Kitchen, Bathroom and a private Terrace or Balcony overlooking the Aegean Sea and the Volcano. Cave-style apartments dressed with black volcanic stone on the outside, consisting of one separate Bedroom with double bed, a loft with one more double bed, Living/Dinning area, fully equipped Kitchen, Bathroom and a private Terrace or Balcony overlooking the breathtaking view of the Aegean Sea and the Volcano. It is a unique cave-style house consisting of two separate Bedrooms with their own Bathroom (one of them with Jacuzzi) and one double bed in each one, a fantastic round Living/Sitting area with 2 built couches, a fully equipped Kitchen, and a private terrace overlooking the Aegean Sea and the Volcano. This house is built and decorated in a very special way, and its rare architectural technique together with its unique location, on the best side of the cliff, make it the absolute Pride of our Hotel. All Apartments are equipped with Air Conditioning, Satellite Color TV, Radio and CD Music, Direct Dial Telephone, Safety Deposit Boxes, Hairdryer and they have daily Maid and Laundry Services. Hotel Facilities include 2 Swimming Pools (Adult & Children), Outdoor Jacuzzi, Sauna, Pool-Bar, Piano Bar, Breakfast Area with view to the Volcano, BBQ Area, and a Conference Center for 50 persons. The Main Pool of the Hotel is the largest Pool on the Cliff Side.